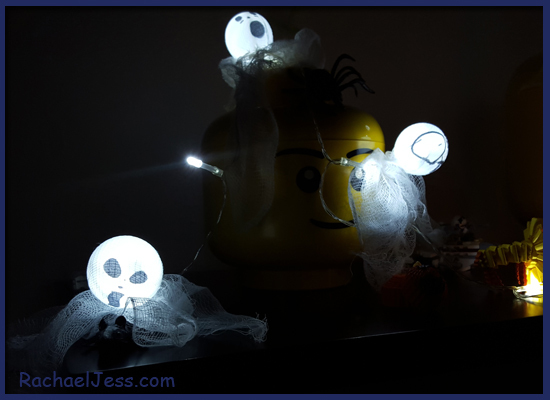 I've always loved the fun side of Halloween and now with Max being a little bit older, he has been able to make some of the choices with regard to what we decorate, where it's placed and the use of scissors! 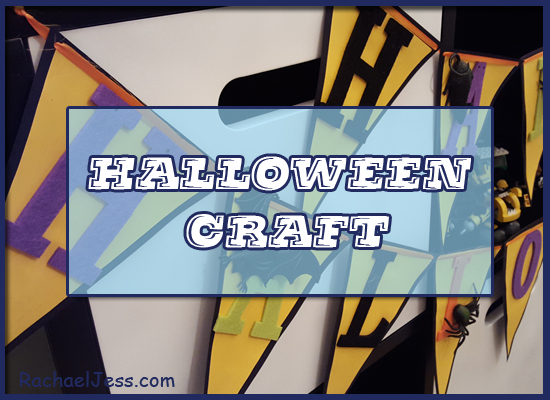 Last year we created some wands and bats, so this year it was all about bunting and ghosts. The gold paper is beautifully bold in colour and because it's A4 in size I managed to get 3 equal sized triangles from one sheet. I originally was going to have happy_halloween as one piece of bunting so would need 15 triangles, but for some reason, I changed my mind and had 2 rows - which I personally feel works better as it's not so long and doubles up to save space. Once the card and the paper were cut I then trimmed the gold around half an inch to give a nice black card border for the bunting. Once glued on to the card this is a good time to get the kids to colour in, draw or even paint. 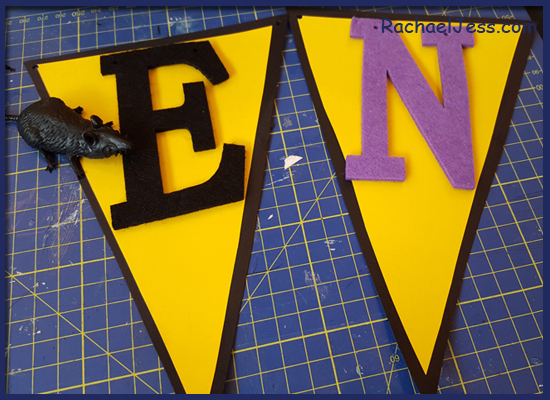 I used letters that we purchased from Sainsbury's but that was on a whim, I had planned to use purple and black paper to cut out the letters. 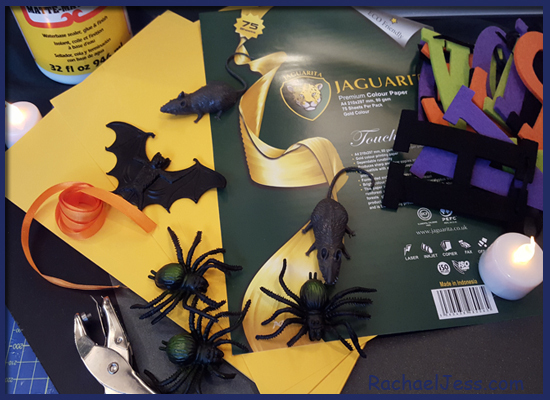 I used my good old faithful Mod Podge to glue the letters on but once Max decided where the bats, rats and spiders were to placed I used my glue gun when he was distracted with Scooby Doo.... .He's 4, so the attention span lasted quite some time! I put the holes through the top of each letter and threaded the letters with ribbon. 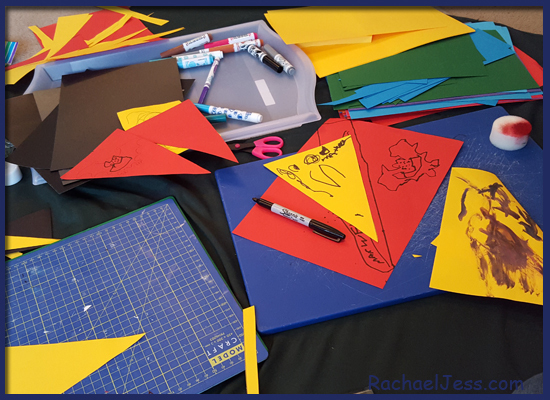 This is a lovely quick and easy craft to do with the kids and gives it their own personal stamp on it by decorating the paper. We also used some of our corrugated strips to make some pumpkins, a spider and a lion. These were a bit fiddly but rather satisfying when complete! And finally, as I mentioned above, our craft projects this year were bunting and ghost related. The ghosts we made were loosely based on the craft I mentioned from my Fandom Friday post. 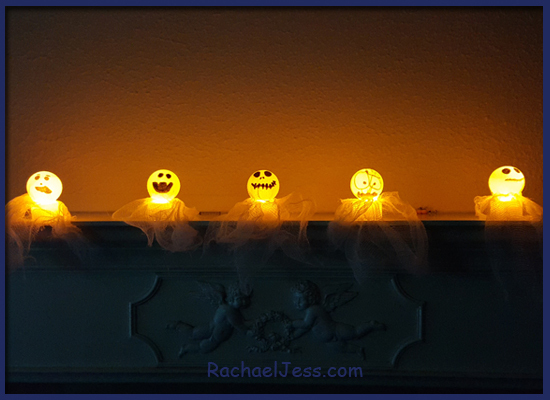 After we created the ghost lights I had some ghosts left over so I made larger holes in the bottoms and placed them over LED tea lights - these I love! 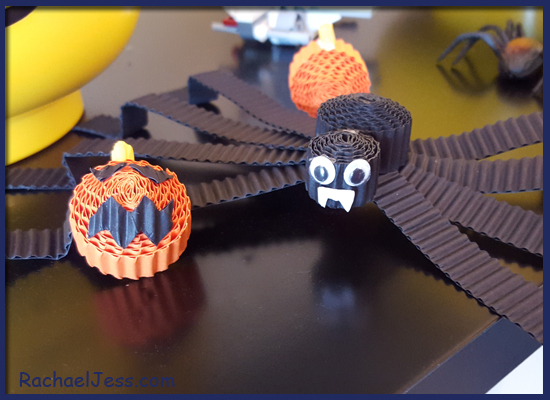 So have you made any Halloween Crafts this year? Those all look great. Love your ghost lights best. No won't be doing any Halloween craft here. I start a week of night shifts tomorrow, so it will be a challenge enough just finding time to carve a pumpkin. Oh no, how on earth do you find time to do everything, when you work nights? Oh you must Angela, I bet they'll look fab!